The Boundary Waters Canoe Area Wilderness (BWCAW or BWCA), is a 1.09 million acre (4,410 kmÂ²) wilderness area within the Superior National Forest in northern Minnesota (USA) under the administration of the U.S. Forest Service. 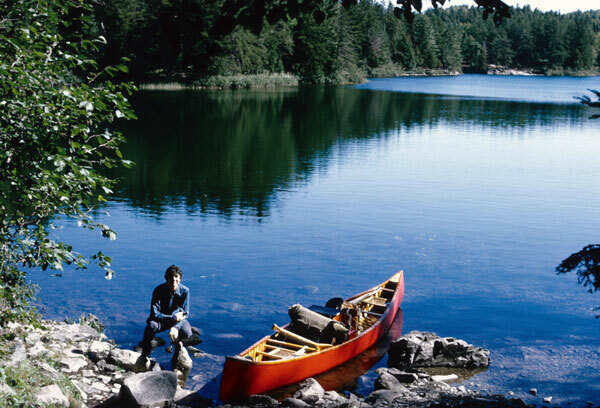 The BWCAW is renowned as a destination for both canoeing and fishing on its many lakes and is the most visited wilderness in the United States. The BWCAW is located on the U.S.-Canadian border. Along with Voyageurs National Park to the west and the Canadian Quetico and La Verendrye Provincial Parks to the north, they make up a large area of contiguous wilderness lakes and forests called the “Quetico-Superior country”, or simply the Boundary Waters. Lake Superior lies to the east of the Boundary Waters. The continental divide between the Great Lakes and Hudson Bay watersheds runs northeast-southwest through the east side of the BWCAW. The crossing of the divide at Height of Land Portage was the occasion for ceremony and intitiation rites for the fur-trading Voyageurs of the 18th and 19th centuries. The wilderness also includes the highest peak in Minnesota, Eagle Mountain (2,301 feet / 701 m). The two main communities with visitor services near the BWCAW are Ely and Grand Marais, Minnesota. The smaller town of Tofte is another gateway community. Several historic roads, such as the Gunflint Trail, the Echo Trail, and Fernberg Road allow access to the many wilderness entry points. The lakes of the BWCAW are located in depressions formed by the differential erosion of tilted layers of bedded rock of the Canadian Shield; these depressions were given their final form by glacial scouring during recent ice ages. The resulting depressions in the landscape later filled with water, becoming the lakes of today. Many varieties of Precambrian bedrock are exposed, including granite, basalt, greenstone, gneiss, as well as metamorphic rocks derived from volcanic and sedimentary rocks. Greenstone located near Ely, Minnesota is up to 2.7 billion years old, some of the oldest exposed rock in the United States. A water lily near Jordan LakeThe Boundary Waters area contains both the boreal forest (taiga) and a mixed conifer-hardwood forest known as the North Woods, which is a transition province between the northern boreal forest and deciduous forests to the south. The ranges of the plants and animals continue north into southern Canada and south into the rest of the upper Great Lakes region. Trees found within the wilderness area include red pine, eastern white pine, jack pine, birch, balsam fir, white spruce, and white cedar. Blueberries are common in many parts of the BWCAW, as are raspberries. The BWCAW is estimated to contain some 400,000 acres (1,600 kmÂ²) of old growth forest, woods which may have burned but which have never been logged. Forest fires were a natural part of the Boundary Waters ecosystem before fire suppression efforts during the 20th century, with recurrence intervals of 30 – 300 years in most areas. On July 4, 1999, a powerful wind storm, or derecho, swept across Minnesota and southern Canada, knocking down millions of trees and affecting about 370,000 acres (1,500 kmÂ²) within the BWCAW. This event became known officially as the Boundary Waters-Canadian Derecho, commonly referred to as “the Boundary Waters blowdown”. Although campsites and portages were quickly cleared after the storm, an increased risk of wildfire continues to remain a concern due to the large number of downed trees. The U.S. Forest Service has undertaken a schedule of prescribed burns to reduce the forest fuel load in the event of a wildfire. The first major wildfire within the blowdown occurred in August 2005, burning approximately 1,400 acres (5.7 kmÂ²) north of Seagull Lake in the northeastern BWCAW. In July 2006 the Cavity Lake fire burned over 30,000 acres (120 kmÂ²), while the Turtle Lake Fire burned 2,000 acres (8 kmÂ²). In May 2007, there was another wildfire that originated around Ham Lake, just to the east of the Cavity Lake fire. The Ham Lake Fire was the most extensive wildfire in Minnesota in 90 years. It burned from May 5 to May 20, and eventually covered 76,000 acres (310 km2) in Minnesota and Ontario. Gray wolfAnimals native to the region include moose, beaver, bears, bobcats, bald eagles, peregrine falcons and loons. The Boundary Waters is within the range of the largest population of wolves in the continental United States, as well as an unknown number of Canada lynx. Woodland caribou once inhabited the region but have disappeared due to loss of habitat, encroachment by deer, and the brainworm parasite carried by deer which is lethal to caribou. Increasing deer numbers may also affect the future of vegetation in this region as they favor some species over others, such as white cedar. Within the BWCAW are hundreds of prehistoric pictographs and petroglyphs on rock ledges and cliffs. The BWCAW is part of the historic homeland of the Ojibwe people, who traveled the waterways in canoes made of birch bark. Prior to Ojibwe settlement, the area was sparsely populated by the Sioux who dispersed westward following the arrival of the Ojibwe. The Grand Portage Indian Reservation, just east of the BWCAW at the settlement of Grand Portage, is home to a number of Ojibwe to this day. A Voyageur canoe during the fur trade eraIn 1688, the French explorer Jacques de Noyon became the first European known to have traveled through the Boundary Waters. Later during the 1730s, La Verendrye and others opened the region to trade, mainly in beaver pelts. By the end of the 18th century, the fur trade had been organized into groups of canoe-paddling voyageurs working for the competing North West and Hudson’s Bay Companies, with a North West Company fort located at Grand Portage on Lake Superior. In the 1920s Edward Backus, a local industrialist, proposed building several dams in the region, which was successfully opposed by Ernest Oberholtzer. By 1926, the Superior Roadless Area had been designated by the U.S. Forest Service, offering some protection from mining, logging, and hydroelectric projects. The Wilderness Act of 1964 made the BWCAW legal wilderness as a unit of the National Wilderness Preservation System, while the 1978 BWCA Act established the Boundary Waters regulations much as they are today with motors allowed only on a few large entry point lakes. Several aspects of the management of the BWCAW remain controversial today, including the use of motorboats, snowmobiles, motorized portages, permit availability and allocation, as well as suggestions to expand the wilderness area. A wood-and-canvas canoe by Ely craftsman Joe Seliga evokes the heritage of the boundary watersThe BWCAW contains over a thousand lakes and attracts visitors with its reputation for canoeing, canoe touring, fishing, backpacking, dog sledding, and remote wilderness character. The BWCAW is one of Minnesota’s top tourist attractions, drawing visitors from all over the United States as well as abroad. Permits are required for all overnight visits to the wilderness area. Quota permits are required for groups taking an overnight paddle, motor, or hiking trip, or a motorized day-use trip into the BWCAW from May 1 through September 30. These permits must be reserved in advance. From October 1 through April 30, permit reservations are not necessary, but a permit must be filled out at the permit stations located at each entry point. Canoe campers on a trip in the BWCAWAlthough there are numerous campgrounds surrounding the wilderness, most campsites in the BWCAW are accessible only by water. As of 1999, about 75% of the BWCAW’s water area was reserved for non-motorized boat travel. Most lakes and rivers are interconnected by portage trails, resulting in over 1000 miles (1,600 km) of canoe routes. Routes are easily chosen by selecting chains of lakes and portages of any length and difficulty. Some of the most popular entry points include Lake One, Trout Lake, Mudro Lake, Moose Lake, and Snowbank Lake near Ely, Saganaga Lake and Seagull Lake at the end of the Gunflint Trail, and Sawbill Lake near Tofte. Canoe campers often use Duluth packs, designed for easy portaging and loading in canoes, to carry their gear. Fishing in the BWCAW can be some of the best in Minnesota. Game species include northern pike, walleye, largemouth and smallmouth bass, yellow perch, whitefish, and lake trout, among others. Popular lures include rapalas, jigs, and spoons, while live bait such as leeches are also used. Multi-sectioned or collapsible fishing rods are often used for ease in carrying while portaging. Sunset over Pose Lake, a small lake accessible only by foot.In addition to shorter trails to Eagle Mountain, Magnetic Rock, and Angleworm Lake, the Boundary Waters has several long-distance trails. The Border Route Trail runs east-west for over 60 miles (97 km) through the eastern BWCAW, following the ridges between the long border lakes such as Loon, South, and Rose. Eventually, a connection is planned from the eastern end of the Border Route Trail to the northern end of the Superior Hiking Trail. The Kekekabic Trail traverses the Boundary Waters from the Gunflint Trail on the east to Snowbank Lake on the west and is the only footpath through the center of the wilderness. There are also three longer loop trails in the Boundary Waters: the Pow Wow Trail, the Snowbank Trail, and the Sioux-Hustler Trail. These longer trails see a variable amount of maintenance; current conditions should be determined locally before use.